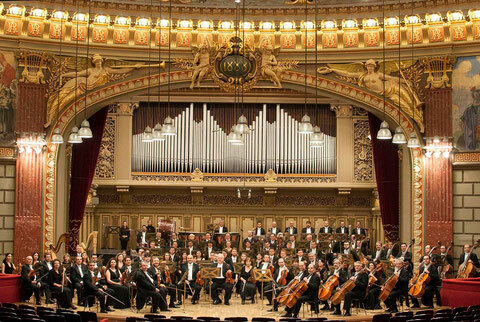 For more than 140 years, the George Enescu Philharmonic Orchestra has made the heart of Romanian music life beat right in the centre of Bucharest, at the Romanian Athenaeum, the place where the traditional blends with the modern. The generous space, both spectacular and solemn, has enabled music lovers to listen to works by great classical as well as contemporary composers. Eduard Wachmann, George Enescu, George Georgescu, Constantin Silvestri, Mihai Brediceanu, Cristian Mandeal – all of them full-fledged maestros who proved to be skilled leaders, capable of preserving the performance level of the ensemble to high international standards. During the golden inter-war years, under the dome of the Romanian Athenaeum the greatest musicians of the time such as Igor Stravinsky, Maurice Ravel, Arthur Rubinstein, Richard Strauss, Herbert von Karajan and Pablo Casals could be listened to and cheered. The professional level meets the musical standards of the European cultural space where the Philharmonic has always felt at home and where they have always been considered members of the continental musical family elite. The history and chromatic on the exquisite fresco in the Great Concert Hall of the Athenaeum were painted by Costin Petrescu (1872-1954). The building is a historic monument included in the UNESCO World Heritage with an essential role in the Romanian culture. The orchestra and choir are equally exquisite: varied expressiveness, well-balanced resonances and superb virtuosity. Any performance of the orchestra is spectacular: the perfect acoustics of the concert hall, the colours and the dynamics are always fresh, overwhelming and fascinating. Bach, Mozart, Beethoven, Brahms, Bruckner, Mahler, Enescu, Jora – major works of the great symphonists have their place in the repertoire of the Philharmonic Orchestra where every score is always interpreted in a genuinely convincing manner. The first instrumental ensemble of the Philharmonic is charming, mature, balanced and imaginative, with both a professional and energetic spirit that always brought the members of the ensemble standing ovations from the audience. Thus, every performance is a miniature spectacle of the group as a whole and at the end one can surely remember a remarkable solo. Alongside maestro Cristian Mandeal, who was general director for almost twenty years (1991-2010), the George Enescu Philharmonic Orchestra has enjoyed collaborating with several great conductors. After returning to Romania in 1990, Sergiu Celibidache was named honorary director of the orchestra. Horia Andreescu, one of the most highly appreciated Romanian conductors acknowledged internationally, was for several years associated conductor and became main music director of the orchestra during the 2010-2011 season. Sergiu Comissiona, Lawrence Foster as well as Angela Gheorghiu, Ileana Cotrubas, Placido Domingo, Jose Carreras, Heinrich Schiff, Seiji Ozawa and Maxim Vengerov more recently are only a few of the personalities who have revived the Romanian Athenaeum. The list also includes Ion Marin, Christoph Adt, Christian Badea, Misha Katz and Camil Marinescu. These projects have bloomed under the new leadership of the Philharmonic, namely Andrei Dimitriu (since 2010). A new series of wide-ranging educational concerts of the symphony orchestra promoting both modern and Romanian traditional music as well as a fresh revival of the ‘Athenaeum Conferences’. The various artistic activities with Nicolae Licaret as Deputy Artistic Director since 1991, have been successfully developed both on the stage and in the recording studio. Apart from the almost 200 annual concerts, the symphony orchestra has recorded several LPs and CDs and has often toured Europe, Asia and the Far East.